A fair bit of what I have translated professionally (in the past) is what might be called pulp fiction, manga and “light novels” that fit neatly into popular culture. 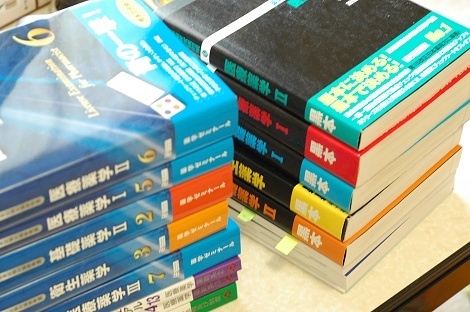 However, the Japanese publishing industry is both large, and intensely competitive. When only the strong survive, the general quality available improves accordingly. I think that Japan has always had a strong storytelling culture. It is hardly alone in this, but the rise of broad-based literacy propelled local mythology into national lore. Once Japan’s nationalistic/ WWII phase was fully resigned to history, and Japan was finally recovering economically and spiritually, manga and, still in its early strides, anime, rose to deliver broad-based entertainment to the masses… but have never displaced the hon (本), or book. Indeed, more and more highly successful anime are now adapted from successful books, giving them a strong plot and a built-in audience. A manga I have just begun to read is called Cage of Eden. If I was to summarize it in one sentence, I would call it a cross between Lost and Jurassic Park. That is, Japanese high school students returning from a field trip stranded after a mysterious plane crash on an apparently uncharted island filled with prehistoric, and deadly, wildlife. You can do this in a black and white manga for immensely less cost than a big budget movie. The only limit is the finite number of pages a chapter can bear and the creativity of the manga-ka (and his or her staff). The tools are roughly the same for everyone, but it’s what you do with them that sets the great storytellers apart. This entry was posted in Art, Culture, Japan and tagged anime, art, books, culture, film, Japan, Manga, popular, storytelling. Bookmark the permalink.